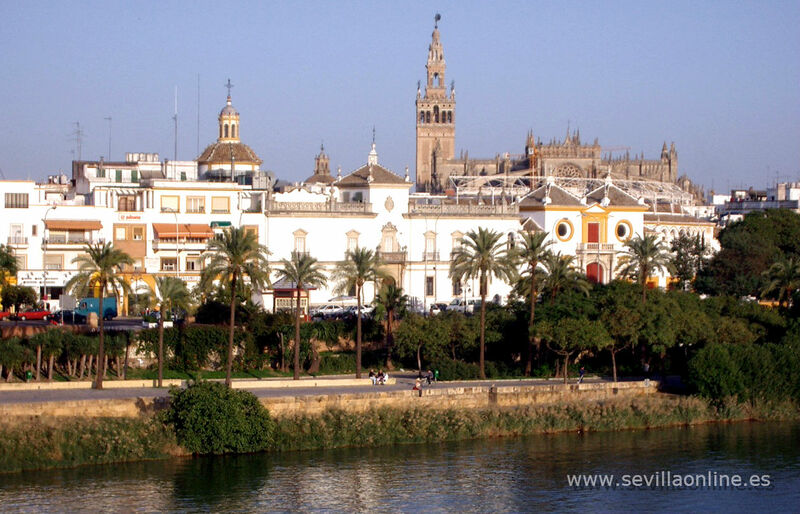 Seville is the capital of Andalusia, the southern region of Spain. It's a beautiful and historic city and it's a great destination for your holidays where sun, light, culture, history, folclore and outdoor life are all to be found under an intense blue and mostly cloudless sky. The excellent weather is the main reason for which important part of (daily) life in Seville traditionally takes place outside, generally on the street. This explains the great number of bars, restaurants and specially terraces all over the city. If there is something not too little of in Seville, it's definitely (tapa)bars, terraces and restaurants. In the historic center there is probably no radius of a 100 meters that does not contain a public drinking or eating establishment. In some areas the concentration is so high you can see, in one glance, over a dozen, like on the Alameda de Hércules, in the Santa Cruz, Triana or Alfalfa districts. Very popular as well is Plaza de España (the spanish square) in the María Luisa Park. In this area you can find many interesting buildings, reminders of the Latin American Exhibition which took place in Seville in 1929. Situated on the banks of the Guadalquivir River, the Torre del Oro (the Gold Tower) is a building of arabic origin (C. XIII) which once formed part of the city walls. Due to it's close links with spanish maritime history, it was chosen as the site of the Naval Museum. This tower marks the entrance to the Arenal district; the bullfight sector of Seville. Here you can find one of the most emblematic bullrings of Spain, the Real Maestranza de Caballería bullring of Seville. You can also take a look at the Royal Tobacco Factory where the famous story of Carmen (by Bizet) took place. Now it is the main building of the university of Seville.